Born in Orange, Virginia in 1883 to John and Jennie Burroughs, she was of an atypical family. She was the granddaughter of slaves, but her father attended college and was a preacher, and after John Burroughs’ premature death, her mother, a cook, moved to Washington, D.C. with Nannie and her sister (who died in childhood), in search of work for herself and better schools for her daughters. Nannie attended the Colored High School on M Street, a school notable for its now legendary alumni, where she graduated in 1896, with honors in business and domestic science. She then moved to Louisville, Kentucky, where she attended Eckstein-Norton University and laid the foundation for her future when she organized a women’s industrial club that offered evening classes in bookkeeping, sewing, cooking, and typing. She graduated in 1904 and became a member at the Theological Faculty at Louisville’s State University, but returned to Washington, D.C. the following year. When Nannie returned to the city, despite earning high marks in a civil service exam, she was denied a position in the public school system. 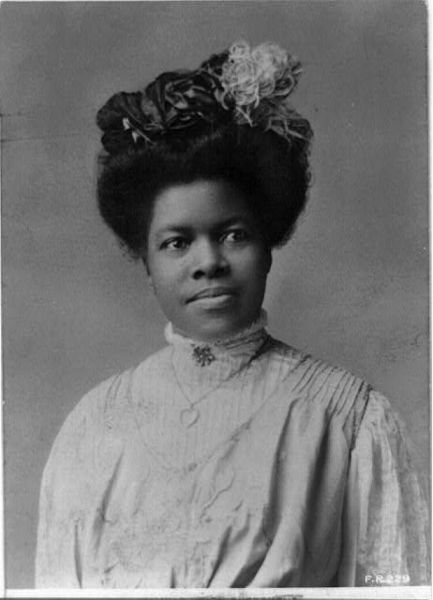 She was very disappointed by this setback, but it only strengthened her burgeoning commitment to the plight of poor and working-class black women, advocating the unionization of domestic workers because “the women voters will be keen to see that laws are passed that will give eight hours a day…to women in other industries, but they will oppose any movement that will, in the end, prevent them from keeping their cooks and house servants in the kitchen twelve or fifteen hours a day.” She became one of the most outspoken–and to many, radical–members of the Women’s Convention of the National Baptist Convention and the National Association of Colored Women, the former organization the largest body of African American women in the nation. Burroughs received an honorary M.A. degree from Eckstein-Norton University in 1907, and her pivotal role in the aforementioned organizations allowed her to mobilize both to support her greatest achievement, the National Training School for Women and Girls. Burroughs opened her school in 1909 with thirty-one students in a “dilapidated, eight-room farmhouse” purchased for $6,500 just outside D.C., in a community called Lincolnville, which had fewer than a dozen houses and no paved streets, water, or electricity. The money was donated almost entirely by blacks, and though white philanthropists were solicited for donations, at no point did the school’s existence depend upon white funding, which was quite rare for the period. The school was indelibly stamped with her aims for black women, and there she created a “creed of racial self-help through her program of the three Bs-the Bible, the bath, and the broom. The Bible, the bath, and the broom stood for a clean life, a clean body, and a clean house.” The school prepared its students for employment, with courses in domestic science and secretarial skills, but also in unconventional occupations such as shoe repair, barbering, and gardening. Burroughs also distilled a sense of pride for their heritage in her students, requiring each to pass a course in African-American history and culture to fulfill graduation requirements. By the time of Burroughs’ death in 1961, the National Training School had granted the equivalent of high school and community college degrees to over 2,000 black women from the United States, Africa, and the Caribbean, but her life and activism touched and inspired ten times the number of graduates throughout her lifespan. I’ve heard of Burroughs, though for the life of me I can’t remember where. Was there a movie about her? I looked, but didn’t find anything. Maybe it was a documentary?